Have a go at our Halloween Witch. 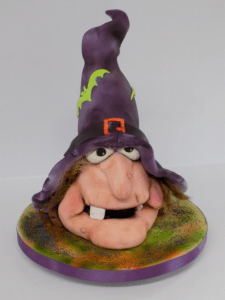 I will demonstrate the skills as we work step by step for you to create Winnie as part of your fun filled family Halloween Bank holiday. All work is done freehand and no cutters needed. Tools, cake and fondant will be provided in class. Please bring an apron, lunch and a box to take home your creation. Please bring an apron, lunch and a box to take home your topper. 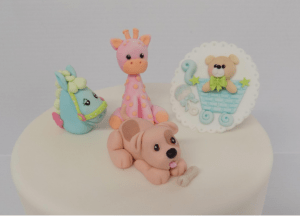 I will teach you the secrets of modelling nursery animals that will inspire you with wonderful ideas suitable for Baby’s Christenings, Birthdays etc. These cute little animals will put a smile on anyone’s face making your celebration special. These are made Cup cake size but easily adapted to a larger size. Cup cakes provided with all other materials needed for class. 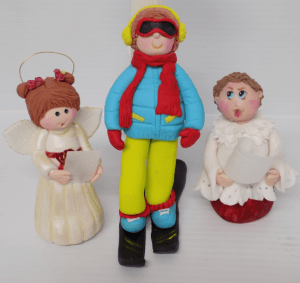 Come along to this Novelty Christmas cake topper morning and join in the fun creating three Christmas cake designs. Lot’s of easy ideas to decorate your Festive cake. Everything needed is provided for in class. All you need to bring is an Apron and a Box to take home your toppers. You will learn how to sculpt a 3D design into real cake, Almond paste and cover it with Icing. You will work with fondant/Sugarpaste to cover it and model some details such as eyes, nose, cheeks, Christmas stocking and a bow. You will texture his beard and trimmings such as the hat, cuffs, stocking top and bottom of the coat. Perhaps you would be interested in honing your skills in our PME Professional Diploma Course’s The Sugarpaste Module, Royal Icing Module and Sugarflower module. All Information can be found on this website. 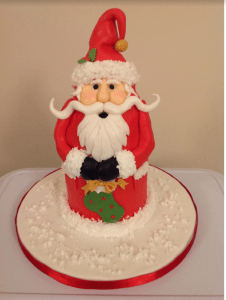 Come along to this Christmas workshop and have a fun time making this Nostalgic Christmas Cake. This class is suitable for Beginners and advancing. All decorations are hand made and lots of modelling skills and tricks to learn. We will be working on a 6inch polystyrene dummy. If you wish to bring along your own cake please do so. It should be at least 4 inches high and covered with almond paste or a Ganache finish. All other materials and tools are supplied in class. Please let Joyces know if you are bringing your own cake. Box large enough to take your cake home. Fee includes Fondant, Colours and the use of all tools in class.